August 8th, 2016 – A long running public television staple is the latest victim of the Internet and some people, including the show’s creators, are not happy. 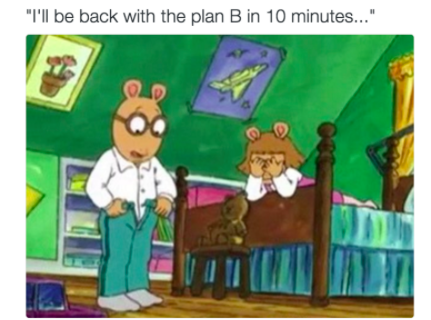 Arthur, chronicling the adventures of a bespectacled aardvark and his colorful cast of family and friends, has recently become fodder for a more “mature” set of online memes. Various characters from the Emmy-winning children’s program have previously been depicted in comedic scenarios addressing the foibles and frustrations of daily life, but some of the newest memes are notable for being racially and sexually explicit. For almost twenty years the animated program, based on a book series, has explored young people’s issues and earned a new generation of fans in millennials, who are likely the same people using words like “thot” to describe some of Arthur’s friends. While the show’s creators have gone on record voicing their disapproval that hasn’t stopped people from sharing the racy memes online. Some popular social media celebrities have applauded the creativity of those creating and retweeting the images, and an account solely focused on displaying the salacious side of Arthur has racked up more than 120k followers. Despite the official rebuke, there seem to be no signs of the foul-mouthed fun stopping anytime soon. The animated series has been on air since its September debut in 1996. It is currently the second longest active running show on PBS Kids trailing only behind Sesame Street. Arthur may soon be giving Elmo some advice on how to bounce back after getting meme’d. Do you find the adult-themed Arthur memes Funny or Offensive? Vote and comment below.